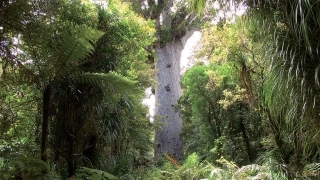 Tane Mahuta - Its Maori name means "Lord of the Forest"
Between Aranga and Waimamaku, on highway 12, this forest contains three quarters of New Zealand's remaining kauri trees. Within the forest's 2,500 hectares, there are a number of walking and tramping tracks, including a wheel-chair access to Tane Mahuta - Lord of the Forest one of the largest trees in the world: 51m. high, with a girth of over 13m. The Kauri trade was instrumental in the development of Auckland but more so for the upper Northern provinces. Gum stores, sawmills, and logging ports all became centres of settlement.